The House Oversight & Government Reform Subcommittee on Government Operations will hold a field hearing in Dayton on Monday June 10th. The hearing, entitled “The Delphi Pension Bailout: Unequal Treatment of Retirees,” will take place at Sinclair Community College. This field hearing will continue to highlight the shameful treatment of Delphi Salaried Retirees by the Obama Administration. They picked winners and losers during a failed bailout which has cost the taxpayers billions of dollars and these retirees their futures. I will continue to support the retirees in their efforts to have their pensions restored, as well as to hold this Administration accountable for their actions. "I stand with Congressman Turner in his fight to restore the pensions of Delphi retirees across Ohio and around the country. It is deplorable to see that the Administration has chosen to protect the pensions of their political allies while depriving others of the pension they earned. These hard-working Americans deserve to be treated fairly and to have their pensions restored immediately. 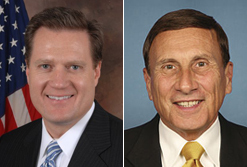 I am pleased to hold this hearing in Dayton to bring further attention to what can only be described as preferential treatment by the Obama Administration," said Congressman John Mica.